A contusion is simply a bruise. A cortical contusion is a bruise to the surface (the cortex) of the brain. The problem with contusions (hematoma’s) is not only that they involve the collection of blood outside of blood vessels, which is toxic to brain tissue, but a contusion also increases the amount of fluid within the skull (brain swelling), thus increasing intracranial pressure. Increases in intracranial pressure, (ICP) is the biggest cause of secondary brain damage, and potentially death. As pressure within the brain increases, it becomes harder and harder for blood to perfuse (flow) throughout the brain. The smallest of the blood vessels, the capillaries, are the vessels that actually provide the fuel and oxygen for the brain to work. Think of brain activity as a microscopic fire occurring on the cellular level. It needs fuel, which is glucose (blood sugar) and oxygen to burn. It also, perhaps more importantly in understanding brain pathology, must exhaust the by-product of this fire. It is believed that it is the failure to exhaust the spent glucose that first causes brain damage when the capillaries become to compressed to flow to all parts of the brain. Absence of oxygen actually takes longer to cause damage than failure to remove the waste products from the brain. As ICP increases, progressively larger and more blood vessels will have blood flowed effected. At some point, the increase in pressure will sufficiently compress the brain stem, interrupting involuntary nervous system activities, such as heart beat and blood pressure and result in death. Relieving the increase in ICP from hematoma, along with stopping bleeds which can cause brain swelling (which also quickly result in increases in ICP) are the primary purposes of brain surgery after severe brain injury. Such surgery often involves removing a portion of the skull, so that the brain has room to expand and prevent secondary damage from an increase in ICP. Such surgery is referred to as a craniotomy or a craniectomy. Click here for more on craniotomy or a craniectomy. An epidural hematoma is a bruise that occurs between the dura and the skull. Subdural hematoma is a bruise that occurs between the dura and the brain. The brain is divided into two hemispheres, which are symmetrical. Normally, a fairly straight line can be drawn between the two hemispheres, down the center of the brain. If brain swelling occurs on one side of the brain or another, it pushes one hemisphere across this center line. 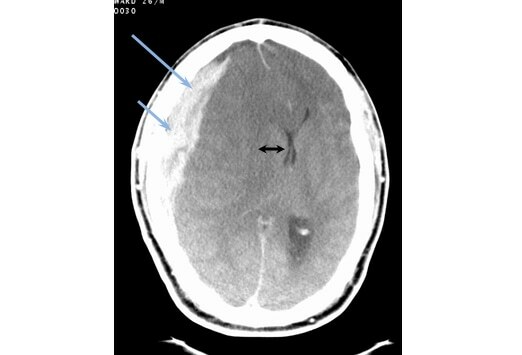 This is called a “midline shift.” It is one of the most obvious evidences of brain swelling on CT scan. This type of swelling is particularly dangerous because it may also be accompanied by compression of the brain stem, which can be fatal. For an example of a midline shift, click here. Gordon S. Johnson, Jr., the author of this page is a lawyer, not a doctor, who practices law with the Brain Injury Law Group, S.C. Click here for more on the firm.